No matter how one analyses the Tenang by election its clear that BN has close the gap on Pakatans earlier runaway wins in by elections. Another victory under their belt means that BN has now 6 and with Merlimau by-elections in a months time the gap is closing. The BN will have the feel good factor with them and its up to Pakatan to deny them another victory. The BN will point to correcting the wrongs by the former adminstration and will be confident that the people will give the BN a renewed mandate in the coming GE13. 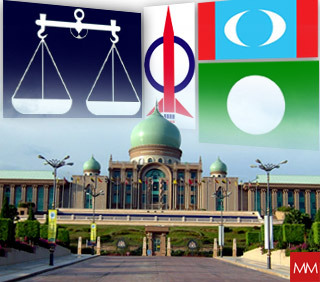 Pakatan will need to rediscover their form and come up with a winning strategy in order to keep their faint hopes and dimming lights alive to see that their dreams of Putrajaya is within reach. The registered voters will have their final say on who runs the country after the next GE. It is up to the present government and the opposition to present itself as the guardian of the peoples trusts when the final votes are tallied. The truth is ……. 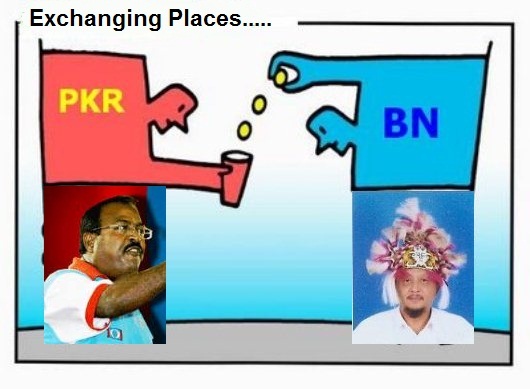 IT WILL BE UP TO BN AND PAKATAN TO SORT THEMSELVES OUT……. These two names Gobalakrishnan ( Padang Serai PKR MP) and Tedcwin Ngumbang (PRS deputy Information Chief) at the bests of times are very useful to their respective coalitions. They both are at anytime politicians who will kick up a storm to create chaos which will benefit their parties and ensures it stays very relevant. Both are considered too very useful and are straight talkers and has no regrets in opening their mouths to lambast if they see that their CITIZENS RIGHTS are being suppressed. 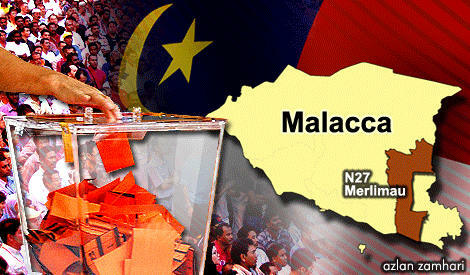 After this weekends Johor Tenang by elections the focus will turn to Malacca. The Election Commission decided tonight to hold the Merlimau by-election on March 6. Nomination day for the Malacca state seat is February 26. It is the 15th by-election since Election 2008.The seat fell vacant after the incumbent, Barisan Nasional’s (BN) Datuk Mohamad Hidhir Abu Hasan, 54, died on January 20. In the 1999, BN won with a majority of 2,252 votes, 2004 (5,087 votes) and 2008 with 2,154 votes.Mohamad Hidhir, who was also a state executive councillor, defeated PAS’s Jasme Tompang in the March 2008 general election. 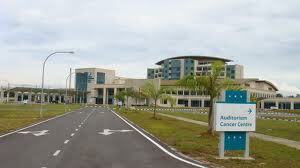 It seems that the Samarahan Sarawak International Medical centre is being questioned by the Sarawak DAP. Does SUPP need to answer..?? We are not trying to cover the party but it seems that the DAP Assemblyman and MP has all the answers in his hands. Is he probing to find the truth or is he trying to score political points especially attacking Dr Sim Kui Hian who SUPP has just identified to stand in the Pending State Constituency. Moreover he continued,”Chong said the hospital has turned out to be the most expensive in Malaysia, if the total cost of construction was RM400 million as reported and the number of beds at 168 were to be taken into account.”Based on calculations, the cost of one bed in the hospital will be RM3.2 million, way above the RM500,000 per bed Health Minister Liow Tiong Lai mentioned last year. DAP Chong it seems that you have the answers and you are just going for Sim as he will be the candidate for SUPP. 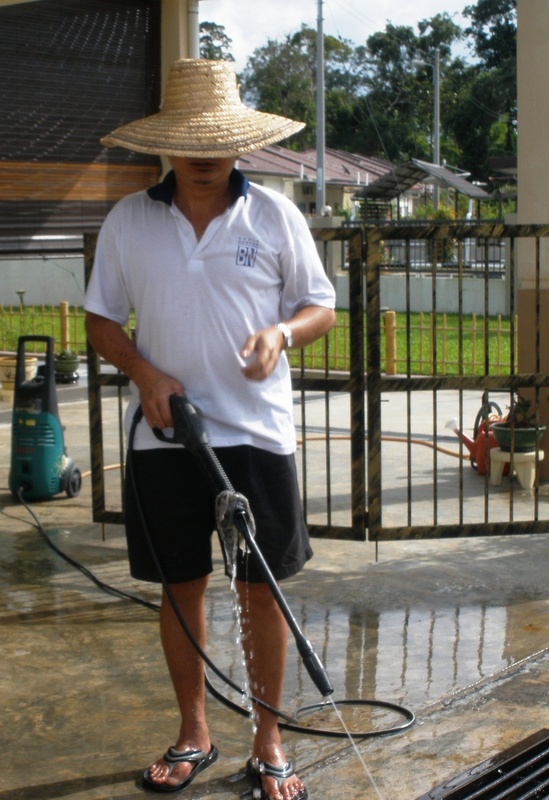 There is a time and place for all this and the DUN ,PAC,ceramahs sounds the most appropriate avenue. Don’t you think so..?? Wow! Questions and Answers All in Place….. When N22 was mentioned at lunch this afternoon one mans eyes gleamed with full of enthusiasm and anticipation. Here is one seat which this man holds dear eventhough in 1991 he stood as a candidate and losts in a five cornered fight against the eventual winner in BN Candidate Julaihi Narawi. The sudden surge of PKR which seemingly felt at one time all-out no-holds-barred assault on the Sarawak BN has somewhat losts momentum. But our man Maxwell Rojis 58 has withstood the temptation to leave PKR and jump overboard into the reenergised SNAP or even to BN parties. He knows that his people still live without basic amenities such as roads, jetties, clinics, treated drinking water, and electricity. Time for them has stood still since independence in 1963.Moreover there has been many promises and ‘we want change and everyone in BN has been given too long to change and yet nothing has improved dramatically in Sebuyau. When we told Max that Julaihi Narawi (BN-PBB) has withstood the challenges and yet he won on numerous occasions in this constituency of 7549 what chances does he have? He also said that previously PKR fielded Mohamad Akek and he was defeated easily by Julaihi and the might of BN machinery. But this time round he assures the PKR hierarchy that it will be different. The mood of the people has changed especially with so many issues and the mosts outstanding one is the “land grabbing issue” and also the overstaying of Taib as Chief Minister in Sarawak. Max knows that this is the bests time for PKR and its Pakatan Sarawak partners to cross swords with the BN4 in PBB,SUPP,PRS and SPDP. In 1987 at the height of the Ming Court affair there were no helpers from the Peninsular as PBDS and Maju group stood alone as he remembers very well. The surge of SNAP going after 28 seats has also created tension amongst the Pakatan fold but Max says that its only mathematics that counts. When asks about the possibility of being “persuaded” after nomination to relinquish he said put it in writing,” NO WAY NOT MY STYLE“. So it seems the battle lines are drawn and PKR will need to vet through their lists and come out with a winnable candidate. Someone,somewhere,somehow must have sold the idea to SNAP that former glory is achievable says a former Emeritus Professor. It was clearly seen that PRS in the Lubok Antu by election used “Sarawak for Sarawakians” which is a strong local propaganda in itself. PKR being a national based party was more or less totality brought to its knees eventhough they had a former 5 term MP as their local candidate. The propaganda brings in itself a strong attachment and sentimentality that this land Sarawak must only be ruled and taken care by Sarawakians. 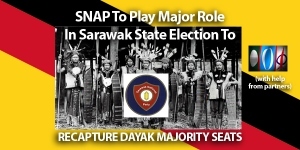 SNAP through its trials and tribulations is seeking to address a local issue that their dayak leaders in BN component parties are too submissive and have losts their direction in preservation of their land and the ways of governance. This is not a new issue for the dayaks as subconsciously they know that their leaders are promised the highest of the heavens when they are in the BN coalition. SNAP was in the BN coalition and they know how the BN operates. Pakatan is not too dissimilar as the coalition too is trying to wrestle power and rule the State in their own way. SNAP knows the local terrain very well unlike their Pakatan partners in PKR,DAP and PAS especially in the dayak majority areas. The 71 seats available must be justifiable allocated and divided fairly amongst the coalition partners or else they will be dissatisfaction in the rank and file. BN has also faced this baptism of fire but through the years the jigsaw has been fine tuned to accomodate each BN component party. Football too has its strategies and SNAP as a political party will need to rechart,reinvent and reenergise its machinery to be acceptable in the Pakatan coalition with its new members some of them were parked in PKR to remain relevant to the Sarawak political climate. The Fire will need to be doused before it engulfs further and negotiations within the ranks needs to be stepped up. The earlier the EGOS are thrown out the better it is for the coalition. BN will obviously love to see a breakup in the Pakatan Sarawak coalition as it will see opposition parties at war with each other. SNAP is in our midst and BN and Pakatan like everyone else in the political playing fields that we must never ever write our enemies off. TO DO SO WE DO IT AT OUR OWN PERIL.